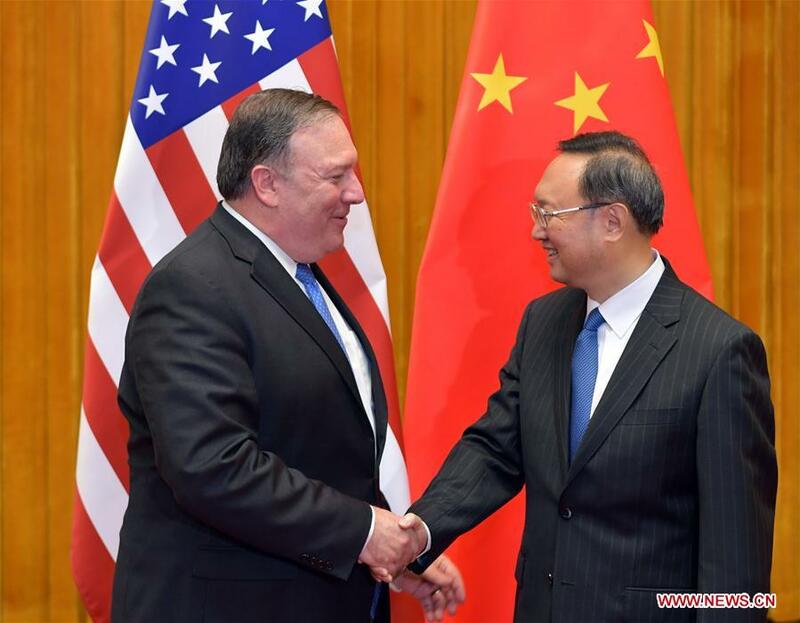 BEIJING, June 14 (Xinhua) -- Yang Jiechi, a member of the Political Bureau of the Communist Party of China (CPC) Central Committee, met with U.S. Secretary of State Mike Pompeo on Thursday in Beijing. He expressed hope that the United States will work with China to expand practical cooperation in various fields, properly handle differences and promote the bilateral ties for bigger progress. Pompeo said the United States adheres to the one-China policy, and stands ready to enhance cooperation with China in order to make bilateral relations more fruitful. They also exchanged views on the Korean Peninsula issue. Chinese State Councilor and Foreign Minister Wang Yi held talks with Pompeo on Thursday. He called on the United States to work with China to implement the important consensus reached by their leaders and promote a healthy development of bilateral ties. Wang called on both sides to constantly inject impetus into their cooperation, and settle the trade issues properly with a win-win approach. He said the two countries should be aware that common interests as well as dialogue and cooperation remain the mainstream of the China-U.S. relationship, and both sides should respect each other's core interests and major concerns, adding that he hopes the United States will firmly adhere to the one-China principle and handle Taiwan-related issues properly. The meeting between the leaders of the United States and the Democratic People's Republic of Korea (DPRK) has important historic significance, as it brought the Korean Peninsula nuclear issue onto the right track of dialogue and peaceful settlement, Wang said. China will continue its constructive role in the political settlement of the Peninsula nuclear issue, he said.